Dr Enrico Bonadio, a Senior Lecturer in the City Law School, says the tobacco industry’s bid to avoid plain packaging by relying on legal arguments around trade and intellectual property rights, is being systematically dismissed by courts around the world. You may already have seen the tobacco packs currently sold in the UK: a dark, murky green colour with large graphic health-warning images and scary messages aimed at informing current and potential smokers about the devastating consequences of tobacco consumption. They have no colourful logos, with the brand name just displayed in small characters in a standard font. These packs are now required by new regulations which entered into force in May 2016. There has been a one-year transitional period for the sell-through of old stock – and from May 20 2017 all tobacco products on sale in the UK must comply with the new rules. The legislative move has been recommended to all countries by the World Health Organisation to reduce the attractiveness of smoking and eventually reduce consumption. Australia was the first country to introduce such strict packaging requirements in December 2012. France and, of course, the UK have since followed suit. It follows significant research that shows these new standardised cigarette packs are much less appealing to consumers – and young people especially. No wonder tobacco companies have challenged the measure in the courts. They have argued that it is useless, too harsh – and is an infringement of their fundamental and intellectual property rights, especially trademarks. Yet, their claims are based on weak arguments and have been rejected by both the High Court of England and Wales and the Court of Appeal. The tobacco industry has faced numerous courtroom defeats of late. Last year Uruguay won a landmark case against the Swiss giant Philip Morris International. The company had sued the Latin American state after it introduced two measures affecting tobacco packaging and trademarks. These were mandatory graphic health warnings covering 80% of cigarette packets (a measure very close to plain packaging) and the obligation for tobacco companies to adopt a single presentation for their brands, dropping for example the “gold” and “blue” descriptors, that could lead smokers to believe one variant was safer than another. The fact that the courts sided with Uruguay would have been encouraging to other countries aiming to introduce controls on tobacco packaging. And even greater encouragement came recently from a World Trade Organisation ruling which deemed that the plain packaging requirements introduced by Australia as compliant with international trade and intellectual property rules – and are therefore a legitimate public health measure. The decision has not been officially announced, but a confidential draft of the interim ruling was leaked to the media and the final decision is expected later this year. The Australian measure had been challenged at the WTO tribunal by Cuba, Dominican Republic, Indonesia and Honduras, countries whose economies strongly rely on the tobacco industry. This is a blow to the industry. The short-term consequences of the WTO ruling – Imperial Tobacco’s shares fell more than 2% after the decision was leaked – reflects the longer-term danger that this ruling poses. It will likely convince other states to introduce plain packaging legislation without fear of violating international trade and intellectual property laws. It basically gives them a green light by removing the regulatory chilling effect that such legal action has produced on countries that wanted to follow Australia’s example. After all, more and more countries seem interested in adopting standardised packaging. As well as France and the UK, Ireland and Norway will introduce packaging restrictions later in 2017, and Hungary in 2018. Many other states are debating similar measures, including New Zealand, Canada, Belgium, Slovenia, Belgium, Singapore and Thailand. So, a legislative trend has started which aims to restrict the ability of tobacco manufacturers to make their products appealing to consumers by using eye-catching words, logos or ornamental features on the pack. And attempts by Big Tobacco to stop it by relying on legal arguments around trade and intellectual property rights are being systematically dismissed by courts around the world. Ultimately, the industry needs to accept the fact that its ability to use fancy brands, especially on packaging, may be reduced by governments for public health reasons. Also that a company’s property rights are not absolute or untouchable. Not only does it not have enough legal basis – as has now been confirmed by several courts and tribunals – but it also disregards legitimate policies adopted by democratically elected governments. What’s keeping Indonesia, China addicted to smoking? It was during a trip to Egypt in 1995 when Edison Siahaan first felt that something wasn’t quite right with his throat. Four decades had gone by since he started smoking at the age of 15. His voice had been raspy for years. Maybe this was just the dry air tickling the back of his throat. Asian men already account for the lion’s share of the world’s tobacco related illnesses, yet a World Trade Organisation ruling this week that upheld tough anti-smoking rules introduced in Australia in 2012, showed that if anything, the gap in attitudes between Asia and the rest of the world may be widening. “Tobacco in China is absolutely devastating,” says Dr Angela Pratt who helps handle external relations at the World Health Organisation’s office for the Western Pacific in Manila. In China, roughly 300 million people smoke, according to the WHO. Most of these are men. More than half of Chinese adults are smokers and two-thirds of young Chinese men start smoking. While smoking rates are steady, the absolute number of smokers is rising in line with population growth. Chinese smokers account for 44 per cent of all the cigarettes puffed in the world. At current rates 200 million Chinese will die this century from tobacco-related illnesses, Pratt says. “That’s a huge burden. The people afflicted are often the sole income earners,” she says. This week, the WTO ruled that Australia’s plain packaging rules, which ban branding and distinctive colouring from packs of cigarettes, were a legitimate public health measure. The ruling knocked back a complaint from Indonesia, Cuba, Honduras and the Dominican Republic, who said the rule amounted to an illegal trade barrier. As the former chief of staff to the Australian health minister who introduced the plain packaging measures, Nicola Roxon, Pratt helped develop the policy, bulletproofing it from court challenges from tobacco companies and governments. Together with graphic warnings and taxes that will push cigarettes up to A$40 (HK$230) per pack by 2020, the measure is credited with accelerating the fall in Australia’s smoking rate. The most recent figures show about 13 per cent of Australian adults smoke and less than five per cent of school children. A dozen countries, from Canada to Chile and Britain to Uruguay are either introducing similar rules or seriously considering them. At the other extreme is Indonesia. The most recent figures, which date back to 2013, show 240,000 Indonesians die every year from tobacco related illnesses. Two-thirds of Indonesian men and boys, over the age of 15, smoke, according to the Ministry of Health. Most troubling are the numbers of new young smokers throughout the archipelago, says Dr Widyastuti Soerojo, chair of the tobacco control unit at the Indonesian Public Health Association. She says some 16 million Indonesian youngsters between the ages of 10 and 19 experiment with smoking every year – a rate of about 44,000 every day. Indonesia is among the few countries that are not signatories to the United Nation’s Framework Convention on Tobacco Control, which among other things aims to curb the appeal of smoking for children. Indonesia television and billboards feature handsome intrepid men jumping out of planes or into business meetings. Roadside kiosks individually sell clove cigarettes, known as kretek, for as little as 10 US cents each. Governments in Jakarta and local governments in vote-rich provinces, such as Central Java and East Java, fend off calls for more curbs on smoking saying they provide badly needed jobs to rural families. But mechanisation and growing taste for machine-made cancer sticks rather than hand-rolled types, belie that argument. Tobacco accounts for about half of one per cent of all jobs in Indonesia, according to the Southeast Asia Tobacco Control Alliance. Campaigners are quick to point out the country’s richest families have tobacco to thank. The Hartonos, Indonesia’s richest family and worth US$17 billion, own kretek maker Djarum. Indonesian cigarette sales totaled US$16 billion in 2015. Sampoerna, which is more than 90 per cent owned by Philip Morris, is Indonesia’s most valuable company. “The government treats tobacco like it’s a normal industry but really this is neocolonialism by tobacco companies,” Dr Soerojo says. Still, there’s progress. Beijing, Shanghai and Shenzhen, with a combined population of more than 60 million, have banned smoking in public areas. China hiked taxes on cigarettes in 2015. The move resulted in a 20 per cent jump in the retail prices of the cheapest brands. Owing to its massive market, that move alone resulted in a more than 2 per cent drop in world tobacco consumption in 2016. In Indonesia, smoking is banned in most public spaces but enforcement peters out the further one travels from the centre of Jakarta. Indonesia introduced graphic warnings on packaging in 2012 and hiked excise taxes on cigarettes by 15 per cent in 2016. Even so, additional hikes for this year were scotched. Glimmers of light are on the horizon, says WHO’s Pratt, but plain packaging is still “a long way off”. The World Trade Organization will not issue a ruling on whether Australia’s “plain packaging” tobacco law usurps foreign companies’ intellectual property rights until May, according to WTO documents circulated Tuesday, delaying a decision that was slated to arrive by the end of 2016. A single WTO panel is weighing cases launched by the governments of Indonesia, Cuba, the Dominican Republic and Honduras asserting that Australian laws that ban all distinct branding from cigarette packages in favor of graphic warnings about the danger of the products. The case has teed up a high-stakes fight over the intersection of intellectual property rights and public health safeguards. There is no precedent for such a law being challenged in Geneva, and the panel apparently needs more time to parse through the various legal issues at play. “The panel wishes to advise that it now expects to issue its final report to the parties not before May 2017, in light of the complexity of the legal and factual issues that arise in this dispute,” the panel said in a statement circulated to the WTO. Australia passed its packaging law in 2011 despite the protestations of numerous multinational corporations who viewed the measure as a direct threat to their use of trademarks and other branding mechanisms to promote their business. The four countries have said the law violates the WTO’s Agreement on Trade-Related Aspects of Intellectual Property Rights, or TRIPS, as well as the Agreement on Technical Barriers to Trade and the General Agreement on Tariffs and Trade. At every step of the way, Australia has claimed that it has the right to curtail businesses’ trademarks in the name of public health. For the first time in the WTO’s history, the panel will have to grapple with how the TRIPS Agreement comports with a country’s right to pursue policy objectives that it deems necessary to safeguard the public’s welfare. The legal battles over the plain packaging law began almost as soon as it went into effect, beginning with a case filed by Philip Morris Asia Ltd. under the Hong Kong-Australia bilateral investment treaty. In that case, the panel handed a win to Australia, albeit on jurisdictional grounds, meaning that the WTO’s decision will likely be the first ruling to address the issue on the merits. Even when the decision does come down, the case will be far from settled as all parties will be entitled to a round of appeals. Nevertheless, the case will continue to be closely watched not only by the litigants and others in the tobacco industry, but also by those companies selling products that could e subject to similar public health rules, such as alcoholic beverages or fatty and sugary foods. The long-awaited decision of a World Trade Organisation panel on Australia’s decision to enforce standardised packaging on tobacco products has been ‘imminent’ for years. While the wait goes on, governments across multiple continents – including Africa, Asia and Europe – are introducing plain packaging legislation at an increasingly swift rate. While this suggests that the tobacco industry’s fight to hold back the spread of plain packaging is on the ropes, the anti-plain packaging lobby has not given up yet. A major development in the last few months, which may have spurred on recent legislation announcements, was the World Bank dispute settlement body’s dismissal of a case brought by Philip Morris International against Uruguay’s implementation of enlarged label warnings on tobacco products. While this follows lawsuit losses against similar regulations in the UK, Norway and Australia, the Uruguay case has long been viewed as a test case, as it was the first time a tobacco group had taken on a country in an international court on this issue. The dismissal was therefore dubbed by commentators as “more than just a local triumph”, with one law lecturer suggesting it “may make it more difficult for tobacco companies to use lawsuits to produce a ‘chilling effect’ and so discourage countries from introducing tobacco control policies”. In the months since that decision, a slew of national governments have announced or signed through plain packaging legislation. The push is now truly global. For instance, Gambia looks set to be the first African country to implement plain packaging, as the country seeks to maintain its award-winning anti-tobacco credentials. In Asia, both Malaysia and Thailand are well on their way to introducing a brand-free environment for tobacco, with pushes to introduce it in India and China too. Finally, following the European Court of Justice’s ruling in May that the new EU directive on tobacco products is valid, plain packaging laws came into effect in Hungary last month (with legislation that goes further than the current EU directive). These recent developments follow similar moves in the last 12 months in Canada, New Zealand, Norway, and France. That’s not forgetting the UK following Australia’s lead by implementing its own standardised packaging laws in May (the same legislation in Ireland was delayed at the last minute). All told, the Canadian Cancer Society lists 14 countries where plain packaging is either now implemented or being formally considered (not including the aforementioned China, Gambia, India, Malaysia and Thailand). But despite the tide appearing to turn, tobacco conglomerates are refusing to give up just yet. For example, Japan Tobacco International (JTI) recently commissioned research into the views that people hold of uniform packaging in Canada (following the Canadian government’s three-month consultation period about its possible implementation, which began in May). Some of the results were published in an op-ed in the Toronto Sun last week. They suggest low awareness of the consultation, with the results showing that “one in five Canadians had heard of the government’s intention to introduce plain packaging” and “only one in 10 understood what it was about”. Of course, it is probable that a high proportion of citizens will be unaware of most government consultations – so those results are hardly a surprise. Additionally, plain packaging proponents will argue that this doesn’t have a bearing on the pros and cons of the regime itself. What it does show is, despite the repeated lawsuit losses, tobacco companies are refusing to give up the fight (and, as this very publication’s trip to the Dominican Republic in May demonstrates, cigar companies remain confident that the fight remains winnable). Of course, this isn’t just a tobacco sector issue and trademark associations have long argued that plain packaging severely impairs the function of trademarks, makes counterfeiting easier and is in violation of international treaties. They have also warned that governments may decide to require plain packaging for other products or industries whose impact on public health is being scrutinised. On the latter, a ‘world first’ study released last week promotes the benefits of plain packaging on sugary products – suggesting that the predicted ‘domino effect’ could soon become reality. Associations are therefore intent to keep fighting the spread of plain packaging. In June, for instance, INTA wrote to the Swedish government to register its opposition over the country’s decision to consider plain packaging for tobacco products. The fight, then, goes on. However, as more countries line up to implement plain packaging regimes, it is getting harder to see how a comeback is possible – that is, unless the WTO panel delivers an upper-cut to Australia’s plain packaging regime early next year. The government is not sure whether a World Trade Organisation (WTO) ruling cited by tobacco giant Philip Morris will have any impact on a lawsuit it is set to file against the firm. Philip Morris (Thailand) Limited (PMTL) is accused of making false declarations about the value of cigarettes it imported from the Philippines and depriving the government of an estimated 68 billion baht in tax revenue. According to a probe by the Department of Special Investigation (DSI) launched in 2005, PMTL under-reported the value of its products when declaring them to the Customs Department between 2003 and 2007. Philip Morris claims the WTO ruling stems from a trade dispute between Thailand and the Philippines. The company says the world trade body issued a ruling against Thailand in 2010 which clearly stated Thailand had no grounds to reject the import price of cigarettes from the Philippines. Deputy Prime Minister Wissanu Krea-ngam said Wednesday three issues arise over the ruling claims made by the tobacco giant. First, he questioned whether the WTO really ruled against Thailand. If Thailand really lost this dispute, it needs to consider whether it has something to do with Thailand’s legal action against the company, Mr Wissanu said. The second is whether Thailand can still appeal against the ruling, and lastly what would happen if the country does not comply with the ruling, the deputy premier said. If it is worth ignoring the ruling, the country can take that risk, he said. Mr Wissanu said the Office of the Attorney-General (OAG) is due to indict the company on Nov 25, and he has informed the cabinet of current events. The company rejected the government’s allegations. “The media reports that resurfaced recently completely ignore the fact that PMTL’s import prices have already been reviewed by various Thai and international agencies having the expertise and authority to address customs matters, and all of them concluded that PMTL did nothing wrong,” Pongsathorn Ansusinha, director of PMTL’s Corporate Affairs department, said. Meanwhile, the Commerce Ministry dismissed media reports the ministry had urged the OAG not to indict the PMTL out of fear of a trade backlash. Commerce Minister Apiradi Tantraporn said the ministry has a clear stance that legal procedures intended to protect the national interest must not be violated by other countries or overseas parties. “The WTO has no authority to interfere in the judicial procedures of its members in a case of tax evasion,” Ms Apiradi added. 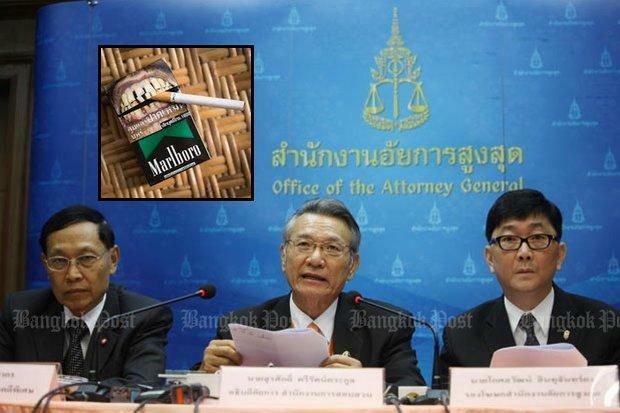 Also on Wednesday, the Action on Smoking and Health Foundation Thailand (Ash) urged the government to ignore concerns that legal action against the company would affect Thai and US trade. Foundation executive director, Prakit Vathesatogkit, said even US state agencies have filed lawsuits against Philip Morris in several cases. “If the firm is confident it is innocent, it should prove it in court,” he said. Tomorrow a World Trade Organization (WTO) dispute settlement panel will begin to hear a second and final round of oral arguments in claims that Australia’s tobacco plain packaging infringes WTO agreements. The hearing will take place at WTO in Geneva from 28-30 October, 2015. An initial oral hearing took place 1-5 June 2015. The outcome of this case is being watched worldwide by governments, health organizations and tobacco companies alike given the crucial nature of plain packaging as a tobacco control measure. Fiercely opposed by the tobacco industry, plain packaging is recommended by guidelines under the World Health Organization Framework Convention on Tobacco Control, the international tobacco control treaty. Under plain packaging, health warnings would remain as would product names in a standard size and font, but tobacco company colours, logos and graphics on packages would be banned. The brand portion of package have the same colour (e.g. drab brown) for all brands. Tobacco packages would no longer be mini-billboards promoting tobacco. There are four complainants that have each brought a claim to WTO: Honduras, Indonesia, Cuba and Dominican Republic. (Another initial complainant, Ukraine, has withdrawn its legal claim). At the October 28-30 hearing, it is only the four complainants as well as Australia that will be entitled to present oral argument. Tobacco companies have admitted to paying legal costs for two of the current complainants: Philip Morris International for the Dominican Republic, British American Tobacco for Honduras as well as for the previous complainant Ukraine. At WTO, only governments can initiate proceedings, which is why the tobacco industry is paying legal costs of certain countries. There are 36 Third Parties that are participating in the proceeding, more than in any previous WTO case. The Third Parties were entitled to present their perspective at the June 1-5 hearing, but will not be able to do so at the October 28-30 hearing. The Third Parties are: Argentina, Brazil, Canada, Chile, China, Chinese Taipei, Ecuador, Egypt, European Union, Guatemala, India, Japan, Korea (Republic of), Malawi, Malaysia, Moldova, Mexico, New Zealand, Nicaragua, Nigeria, Norway, Oman, Panama, Peru, Philippines, Russia, Saudi Arabia, Singapore, South Africa, Thailand, Trinidad and Tobago, Turkey, United States, Uruguay, Zambia, Zimbabwe.